If you are planning the annual school or community festival and need just a little more information to make the event perfect, SignUpGenius can help! 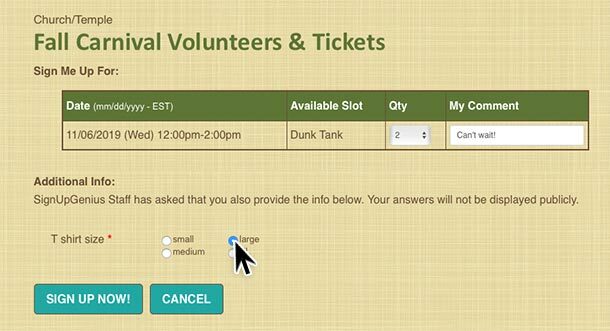 Whether you’re trying to collect T-shirt sizes for volunteers, sort fun run participants by age or gather participant waivers, adding custom questions on your sign up will help you gather the information you need right when participants commit. You can begin to create your online sign up like usual, entering any slots and dates/times that are needed for your event. 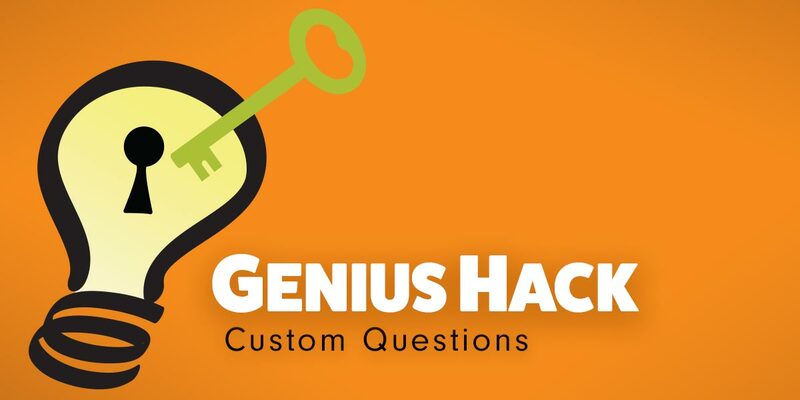 Basic users receive one custom question, while paid accounts receive between five and 10 depending on their level. At Step 5, sign up creators can click the box marked "Add a Custom Question." 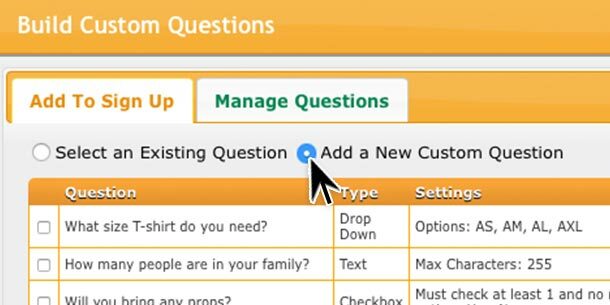 Once you select this option, you'll see a pop-up that allows you to "select an existing question" or "add a new custom question." You can choose to require an answer or make it optional. Your participants will see the question during their sign up process. Ready to review the data you’ve collected? Log into your account and select the “Created” tab, and then select the related sign up. Click on the “Reports and Stats” button at the top of your sign up in the Administrator’s Toolbar. Next, select the correct sign up, followed by “List of Sign Ups for Export to Excel" and "Show All Fields." After you click “Create Report,” you’ll see all the information displayed and have the ability to export to Excel and save as a spreadsheet if desired. Need more advice or tips? Browse our FAQs for answers to common questions or contact our award-winning customer support staff. Manage your sign ups with start/stop dates. Download sign up information with reports. Need more advice or tips? Browse our FAQs for answers to common questions or contact our award-winning customer support staff. And stay tuned for more weekly Genius Hacks.